Valve has made it clear that the Portal series won't be getting Move or 3D television support until its third game at the earliest. Valve may have softened on it's previous belief that the PlayStation 3 was too complicated by developing the upcoming Portal 2 for the system, but that doesn't mean it'll be supporting all the fancy features Sony might want it to. Valve recently told PSM3 magazine (via CVG) that implementing support for the PS3's motion controller Move or for 3D would have to wait "until Portal 3." 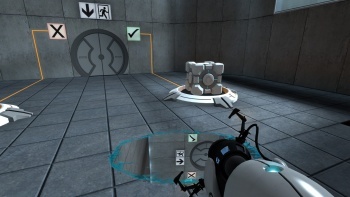 Valve's Doug Lombardi said: "[Move and 3D] will have to wait for Portal 3 or another title. We won't be supporting those in Portal 2." Valve does not appear to believe that supporting Move or 3D matters for the next few years, if this comment is an indication, as Portal 2 is being released 3 to 4 years after the release of the original Portal. Portal 3 would presumably need another 2 to 4 years. I can't say I'm disappointed, even though I haven't played a game in 3D or with Move yet and I do think that playing Portal 2 in 3D would be super awesome. However, when other developers are ending development on additions to their games due to the addition of Move support, you've got to wonder if it's worth it. At least Valve won't be doing that anytime soon. Portal 2 is scheduled to release on the PlayStation 3, Xbox 360, and PC sometime in 2011. Its many gameplay additions were shown off earlier this year, making it appear to be worth the wait even if it won't bug your eyes out or allow you to play controller-free.